This page will tell you something about the tricycle. The C21 has been developed from the succesful Newton tricycle conversion. Unlike the conversion however, the C21 uses a purpose-built tricycle frame, which has been designed to meet a variety of uses. The frame is mostly built from Reynolds or Columbus tube, and construction is by bronze welding. The absence of the traditional top tube makes the machine easier to mount, which is especially important to those with partial disability, while the use of a specially modified large-bore tube gives ample rigidity. The C21 shares with the Newton conversion the "Tadpole" Kendrick-style layout with centre rear wheel drive, which allows the use of almost any conventional bicycle gear set and gives unrivalled traction as the rider's weight is directly over the driven wheel. It also has the same steering arrangement which gives excellent stability and good handling. The C21 can be built in a variety of frame sizes - both length and height can be varied to suit your preference. The frame is made with a fixed seat tube and head tube angles of around 72° - the head tube isn't, in fact, a head tube but it's in the same place as a bicycle head tube would be from the rider's viewpoint. Equipment can be specified for various cycling activities, the one shown above is a fairly small frame set up as a light touring machine. The frame is obviously heavier than a bicycle, but the overall weight is not excessive with lightweight wheels, tyres and equipment. The machine can be specified with almost any normal cycle equipment. Standard front brakes are mechanical discs on Hope hubs, which are fitted with our own design of 20mm quick-release axles; this makes it much easier to get the machine into a car. Prices depend very much on equipment specified, but start at about UK£2000 for a good but not too expensive setup, using mostly mid-range equipment. We don't see the point in having a custom-built frame and fitting cheap parts to it! Specifying a top-of-the-range groupset can easily add another UK£1000 to the price. a) Complete C21 frame, painted and with front hubs, steering gear and brakes: UK£1600. The design of the C21 has recently been extended to make a tandem version. We've not really decided what this is called - The C21 started out as "a new tricycle for the 21st century", and the name stuck. In any case, the tandem shares its basic frame design with the C21 although it is obviously stronger, heavier and has an extra seat! Using the same layout and geometry as the Newton tandem conversion, is has unrivalled stability compared with a "conventional" tandem trike, while the advantages of traction and drive remain the same. 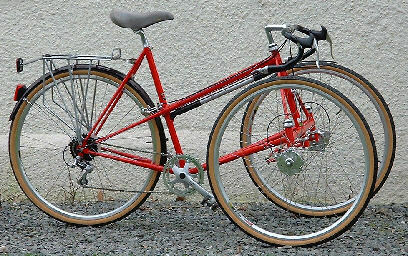 The picture below shows such a tandem: this one is a small frame fitted with ATB size wheels, which makes the machine lower and improves stability even more. The principal visual difference is that the tandem comes equipped as standard with front mudguards. These are not normally necessary on a solo, but on the tandem, the front wheels tend to splash the stoker, which is obviously unpopular. The tandem like the solo C21 is fitted as standard with twin front disc brakes and as with the C21, can be supplied with a wide variety of equipment. As above I have 2 fixed prices, these are UK£1900 for the tandem with hubs and brakes only and UK£2000 for one with complete front wheels. 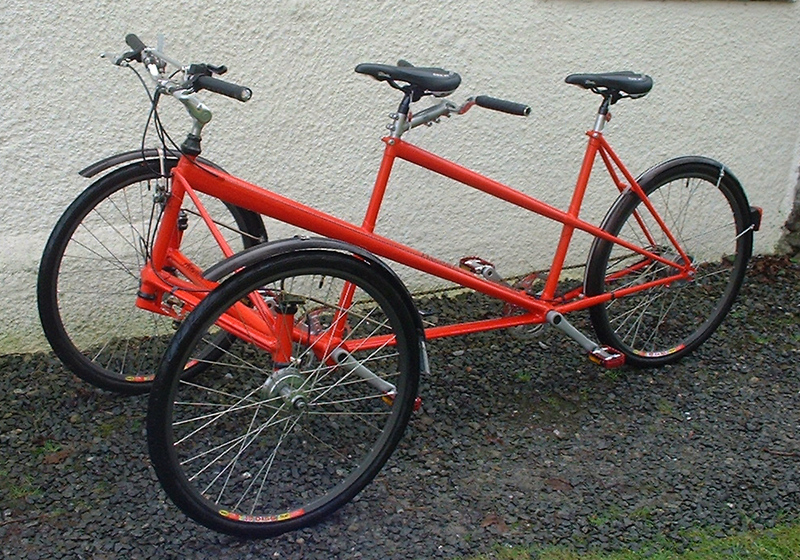 Guide price for a fully built tandem is UK£2500 upwards.